Kalank is a set during the partition era and is replete with beautiful women and sets to gladden a Bhansali’s heart. It is directed by Abhishek Varman who also directed the entertaining “2 States”. The trailer looks interesting and although I can’t quite tell what is going on, there is definitely a revenge theme! From the makers of Gully Boy comes Made in Heaven. Zoya Akhtar, Alankrita Shrivastava (director of Lipstick Under My Burkha), Nitya Mehra (director of Baar Baar Dekho) and Prashant Nair direct. MIH is about Tara Khanna (Sobhita Dhulipala) and Karan Mehra (Arjun Mathur) – two wedding planners in India, planning the big day(s) for the ultra-rich and moneyed. Tara comes from the middle class but is now married to tycoon Adil Khanna (Jim Sarbh), and Karan is gay in an India which only recently overturned the draconian Section 377. Every episode is a new wedding, different people, religions, mindsets, and via these varied scenarios the story deals with a myriad of social issues. The fabulous star cast includes Kalki Koechlin and Shashank Arora (whom you might remember from the gorgeous Titli). Mirzapur is the story of two brothers Guddu (Ali Fazal), who’s all brawn and Bablu Pandit (Vikrant Massey), who’s all brain. Sons of an honest lawyer in a small town, the brothers, through a series of unfortunate incidents, start to work for Akhanda Tripathi (Pankaj Tripathi)and his son Munna (Divyendu Sharma, of the Pyar ka Punchnama films), the criminals who rules over Mirzapur. This series is the poor cousin to “Gangs of Wasseypur”. The genre is about the same, with Mirzapur being even more violent and gory. It is still pretty binge-worthy because it ramps up very quickly, is fast-paced and has a spectacular cast. Delhi Crime is based on the Nirbhaya case, where a woman was gang-raped and fatally tortured in a moving bus in New Delhi. Shefali Chaya is Vartika Chaturvedi, DCP South, the woman in charge of the investigation. This Season of Delhi Crime follows Vartika and her crack team of police officers as they pursue the 6 perpetrators. Rajesh Tailing, Rasika Duggal, Adil Hussain (of English Vinglish fame) are among the superb cast. Soni (Gitika Vidya Ohlyan) is a young policewoman in Delhi. She is honest, hard-working and passionate about her job. Her work is appreciated by her superior Kalpana (Saloni Batra), but Kalpana herself is called to task when the frustrated Soni sometimes let loose. This hard-hitting film is a character study of Soni and Kalpana as they wage war on crimes against women and the entrenched patriarchy. They still have to do it within their limits, and Soni comes very close to crossing hers. The film’s tone is set by the audio we hear in the background – there is always news or the radio playing, the newscasters detailing out these crimes or spewing PSAs exhorting women to be cautious and safe. A similar technique was employed in the short “That Day After every Day”. This spy movie stars John Abraham, Jackie Shroff, Boman rani and Goving Namdeo. Television actress Mouni Roy, who made her debut in Gold, plays the female lead. Although one wonders how much there will be for her to do since she was barely even in the trailer. Robbie Grewal directs – and that’s a bit of an unknown since I haven’t seen any of his work. 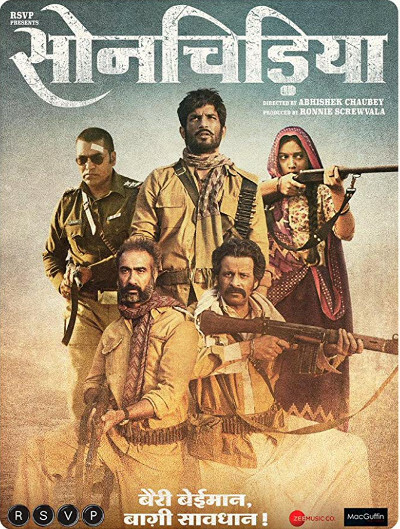 Sonchiriya’s story is situated in the ravines of Chambal valley, circa 1975 during the Indian Emergency. It is about a band of dacoits lead by their leader Man Singh (Manoj Bajpai). When Man Singh is put out of circulation by a police ambush, Vakil Singh (Ranvir Shourey) is elected leader, but some of the gang members gravitate towards Lakhan Singh (Sushant Singh Rajput). The split widens further when the band comes across a woman, Indumati Tomar (Bhumi Pednekar), who asks for their protection from her pursuers, and Vakil and Lakhna disagree on whether they should help her or not. Sonchiriya is literally “golden bird”, an elusive, mythical creature. Here it is used to symbolize absolution for a past misdeed. Lakhna looks at protecting Indumati and getting her gravely injured younger sister (whom she lovingly calls her “Sonchiriya”) to a hospital as his absolution. The film thus centers around Lakhan Singh – the man, his morals and his mission. In one scene he justifies his choice musing that he can face the world, but cannot face himself if he does the the wrong thing. Rajput does a great job of portraying an “honorable” dacoit. Sonchiriya spans a wide landscape. This is a story about the dakus, but it also encompasses in its fold many social ills: casteism, classism, poverty and patriarchy. In a scenes between two women – the dacoit Phulia and the Thakur woman Indumati – Phulia laughs at Indumati’s pretensions to belonging to a higher caste, saying that while men might belong to different castes, women are in a special caste by themselves – the lowest one, oppressed by every other caste. What impressed me about Sonchiriya is its earnest storytelling. The film has many characters, but they all tie together to portray the struggle against oppression and corruption. Sonchiriya is a tale of rebels who have banded together against persecution, but it is also a story of a single good man, an underdog, and his quest to do the right thing, when the lines between right and wrong have blurred. The film has poignant moments when you really feel the desperation and abject misery of the characters. And then there’s the dark humor which masks the harsh reality underneath. All the actors are absolutely fabulous, and make this intense, gripping film as gorgeous as it is. Kudos also to director Chaubey for making this beautifully atmospheric, homegrown Western. 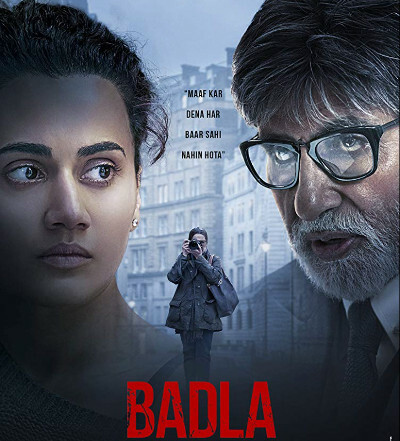 I went in with high expectations for Badla given that the director was Sujoy Ghosh but am disappointed. I’d have expected a smarter film from him, and Badla is barely average, if that. Naina Sethi (Pannu), an up and coming businesswoman stands accused of the murder of her boyfriend photographer Arjun Joseph (Luke). Her husband and child leave her when the affair comes to light. She decides to hire highly recommended lawyer Badal Gupta (Bachchan), and the both of them sit together to form a good defense for her. And that is pretty much how the movie goes – it is two people – Naina and Badal – talking. In conversation Naina relates the details of the case, so a lot of the story is told via flashback-style enactments. Gupta stresses that he wants the absolute truth from Naina, but it is a game of cat and mouse with her hiding facts and he attempting to pry them from her. They conjecture about various scenarios, some from her viewpoint and others from his counter viewpoint, he playing devils’s advocate. Naina proclaims her innocence; Gupta is not quite convinced. So Badla is conversation heavy. Which in itself is not problematic, but the film drags its feet. The pace is slow and plodding especially for a movie of the murder-mystery genre. I actually nodded off a couple of times in the first half, but I really woke up once Gupta started pointing out flaws in Naina’s story and coming up with alternative scenarios. I wish the enactment of the scenarios had been swifter and speedier. A lot of the first half focused on Gupta sermonizing and repetitively demanding the truth and Naina professing her sainthood – not very interesting to watch again and again. The characters lack depth. Naina could have been an interesting character – there were a lot of places Ghosh could have gone with her – but he doesn’t. She just isn’t very well fleshed out. Badal Gupta is just so smarmy and smug, and need I point out the filmi name? Then there were these implausible sounding scenes – like the one where Rani Kaur (Amrita Singh), an absolute stranger, gabs on very friendly terms to Arjun. Yes, the locale is Glasgow and one might argue that the heart gets fonder for apne log in pardes, but still! The ending was predictable but director Ghosh makes it worse with Bollywood-esque drama and rubbing the climactic plot-twist in our faces. A cleaner, sparer, subtler ending was called for instead. Pannu and Bachchan can both deliver fine performances (recall Manmarziyaan, Pink) given the right direction so I have to blame Ghosh for their mediocre performance in Badla. By comparison, Kahaani was a far better film, and while Ghosh can hold his own in short films (e.g. Ahalya) there’s some ways to go before he can deliver a sophisticated edge-of-your-seat thriller. Badla is a step in the right direction for Bollywood where who-dun-its are few and far between, but I can’t quite recommend it. Kidwise: Violence – this is a murder mystery! A mystery at long last! It is directed by Sujoy Ghosh who directed both Kahaani and it’s sequel and the very interesting short Ahalya, from Large Short Films. Kedarnath seems not of this world. Not surreal like Zero, but like a throwback to the 1980s. I mean, it is not like everyone should not have the freedom to make all the old-fashioned cinema they want to, but really? Another jaded inter-faith love story about a Hindu girl falling for the local Muslim porter? Kill me now. The specifics: she’s frisky Mandakini aka Mukku. He’s the staid Mansoor Khan, a “pithoo” or porter helping ferry pilgrims up the steep hillsides of Kedarnath. She takes a shine to him, and he, after much ignoring and rebuffing her flirtatious advances, accedes. Since daddy’s a priest and the upholder of “dharm” there is a bunch of hai-tauba at Mukku’s romantic entanglements with a non-Hindu guy. Just when the young lovers are being separated comes the flood. 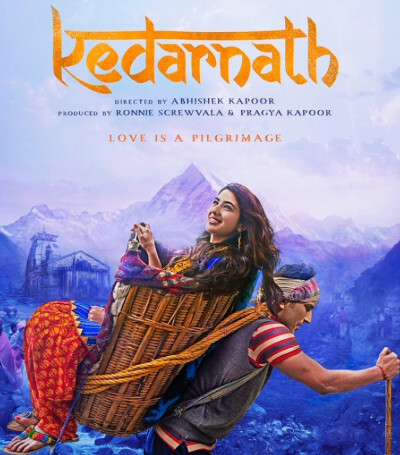 Kedarnath is a dull, dull film. It offers no freshness, no new angle to a clichéd storyline. Even the dialogs are so 80s, so ghisa-pita! There was a story hidden behind Mukku’s seemingly outrageous behavior but the film doesn’t dwell on it too much. I would have liked to see more of Brinda, Mukku’s sister’s (played by talented Pooja Gor) story – there is a segway into that, but the film doesn’t go into much detail. There could have been some exploration of the relationship between the sisters, but that is given short shrift. Perky Sara Ali Khan does bring some pep to Kedarnath, but she really doesn’t fit the small-town girl profile. Sushant Singh Rajput, a good actor, is wasted in his poorly sketched out character. He is still very good as unassuming Mansoor, and I really felt for his character. Nishant Dahiya (of the cute teenie-bopper romance Mujhse Fraandship Karoge) has aged into an almost-gauntness, and plays Mukku’s shrewd, family-ordained suitor. Another actor to note is Sonali Sachdev who is pretty impressive in limited screen time as Mukku’s harried mom. What I did like about the film were the songs, especially Qaafirana. The rest of it is average bordering on deathly boredom. Love might be a pilgrimage (per the title) but this movie was a slog! I convinced my son to come see Gully Boy with us because he, like most desi teenagers, is into rap these days – that was the USP, but I was unprepared for how much rap there was in this movie. He liked the movie more than I did 🙂 . I did like Gully Boy, but not in the way I adored Zindagi Na Milegi Dobara. Murad (Singh) is a chauffeur’s son from Dharavi. His father (Raaz) has taken a much-younger, second wife, which is causing chaos and drama in the small chawl they all live in together. The incessant poverty, the constant beat-down from his parents (keep your head down, a servant’s son will always remain a servant), the ubiquitous classism, the societal strictures preventing him from acknowledging his love for Safeena (Bhatt) are taking a toll on rebellious Murad. He finds an outlet for his pent-up anguish in poetry which, on encouragement from MC Sher (Chaturvedi), he voices through rap. Gully Boy is pretty intense. Zoya Akhtar really drives home the grittiness with realistic dialog, locales and genuine depth to the characters. Ranveer as Murad is Ranveer as we’ve never seen him before: unsmiling and unvarnished – shorn of all his accoutrements and his trademark swagger (what a difference from Simmba!). We see him, another poorly-dressed lad on the street, backpack, earphones in place. We see him at home, head bent, quietly taking the slaps his father deals him for his uppity-ness. Later we see him rebel, and root for him as he starts giving it back, throwing his father’s belittling words back in his face (“Will someone else tell me who I am?”), and we cheer. Gully Boy, despite my aversion to rap, works because it is an underdog story – and we love those. It works because Zoya Akhtar has the courage and the sensitivity to portray a bunch of issues (classism, poverty, powerlessness of women), subtly tying them into the fabric of Murad’s story. And it works because of Murad’s character, who’s got the gumption to battle the soul-destroying chorus of “you are nothing”, and dream on. The cherry on the top are these beautifully done scenes set to some sublime poetry. My favorite was set to “Doori”, as Murad chauffers his employer’s daughter in her expensive car, and she weeps for an unknown reason. He stonily looks ahead, the faceless servant, unable to cross the class barrier to ask or to console. There is another scene set to “Ek Hee Raasta” which questions the rat-race; a portrayal of truth like no other. Accolades to the actors – Ranveer and Alia and Vijay Raaz, known faces all, are terrific. Film debutant Chaturvedi as Sher and marathi actress Amruta Subhash as Murad’s mother are fantastic. Vijay Verma (we saw him in Pink, remember?) as small-time con-man Moeen drove me to tears. Kalki as Berklee-educated musician Sky is as always, just so right. Chaddha, whom we saw recently in Badhai Ho, is impeccable as Safeena’s mom. 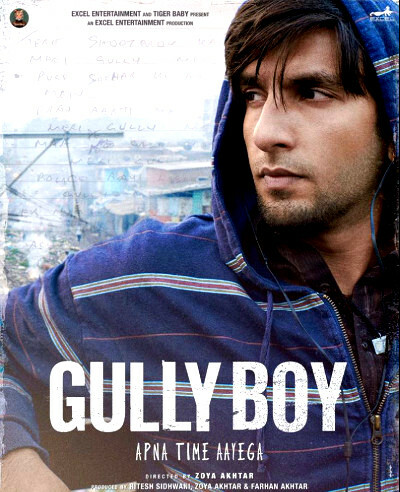 I find Gully Boy a tad lacking in the entertainment department, but was still drawn in and engrossed by Murad’s story. Recommended. Kidwise: Some adult situations, some lip locks, but that’s about it. Zoya Akhtar directs Ranveer Singh and Alia Bhatt in Gully Boy. Quite a different tack for Akhtar because she has in the past directed films like “Zindagi na Milegi Dobara” and “Dil Dhadakne Do” (both of while I loved) which are not quite as gritty as this one looks to be. This spy movie stars John Abraham, Jackie Shroff, Boman rani and Goving Namdeo….